Progress is being made by Granger Construction at St. Mary Mercy Hospital in Livonia, Michigan. 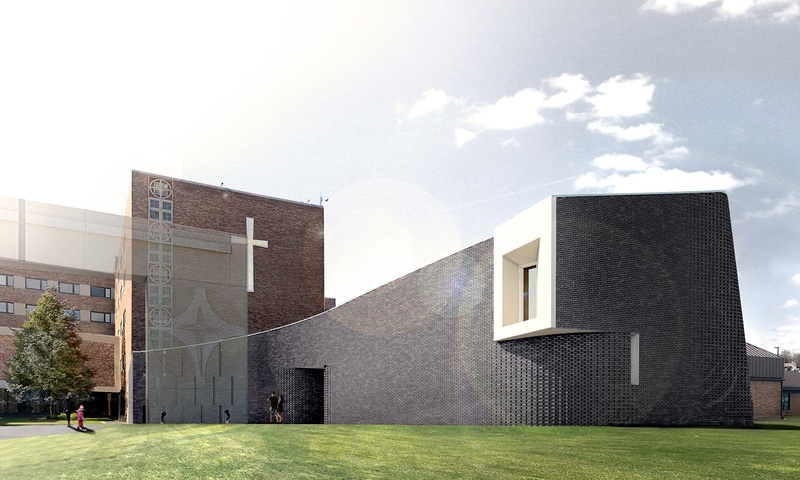 This $3.4 million project includes replacement of the existing chapel and additional spiritual programming including a Muslim Prayer room and a Seekers Space for people of all faiths. The unique geometry of the exterior immediately attracts visual attention from the main entrance. The use of high end finishes and architectural components makes the chapel a destination place for all. The chapel requires detailed coordination of all utilities above the chapel’s compound curved linear metal ceiling. An emphasis is placed on the manipulation of light, especially noticed in the 16-foot high dichroic glass frame used to bring in various shades of light as the movement of the sun falls. Curved wood benches in the Seeker Space, custom-designed limestone altar and a wood slat metal-framed door are just a few of the custom furnishings designed and seamlessly integrated into the construction. To view progress, watch the drone video below.